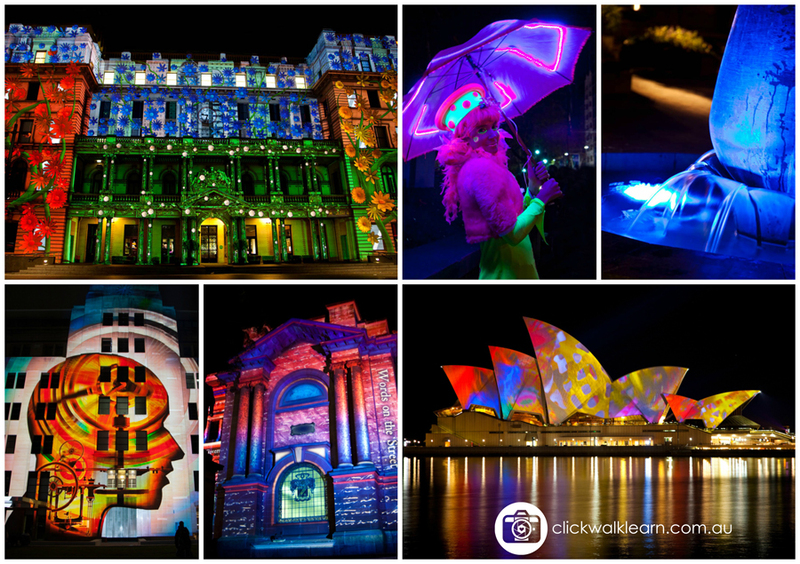 WANT TO TAKE AWESOME PHOTOS OF THE VIVID LIGHT FESTIVAL 2015? April 17, 2015 click walk learn2 Comments on WANT TO TAKE AWESOME PHOTOS OF THE VIVID LIGHT FESTIVAL 2015? It’s nearly that time of the year again! Do you want to take home AWESOME shots of VIVID this year? Have you always wanted to photograph this spectacular event but thought it was far too difficult? Well, it’s really not as complicated as you think!! Why not join me on a click walk learn photography tour specifically designed to teach YOU how to take spectacular shots of VIVID. We will photograph the harbour from the Cahill expressway, plus photograph Customs House, the city skyline, Museum of Contemporary Art, The Opera House, The Sydney Harbour Bridge and all other light installations along the way. Aperture, shutter speed, ISO, focus, composition and many more aspects of this particular type of night photography will be explained to you ‘as we go’. You will take photos using each new technique before moving onto the next level. 5 hours of photography tuition. Booked for the vivid walk. Looking foreword to it.